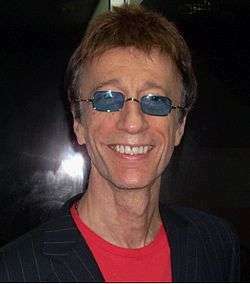 Robin Gibb (pictured in 2008) reached number one on the Top Pops chart in 1969 with his song "Saved by the Bell", but the song did not top the BMRB chart and is therefore not regarded as an official UK number one. He also achieved this feat as a member of the Bee Gees. Top Pops is a former British weekly pop music newspaper. It was founded as a monthly publication by Woodrow Wyatt in May 1967, becoming fortnightly in November 1967. On 25 May 1968, editor Colin Bostock-Smith began compiling a singles sales chart using a telephone sample of approximately twelve W H Smith & Son stores – the first single to reach number one on the Top Pops chart was "Young Girl" by Gary Puckett & The Union Gap. The charts and paper were published weekly with effect from 22 June 1968. On 20 September 1969 the paper was rebranded Top Pops & Music Now, and subsequently became Music Now from 21 March 1970 – at this point the chart was sampling between 30 and 40 stores. From 27 February 1971 the chart was no longer published and in May 1971 the newspaper ceased publication. During the publication of the chart, 55 different singles reached number one. The only one to be knocked off number one and then regain the top spot was "Mony Mony" by Tommy James and the Shondells. The final chart-topper was "My Sweet Lord" by George Harrison. From the advent of charts in the UK until 1969 several magazines and newspapers published their own charts, and there was no one "official" singles chart. In February 1969, however, Record Retailer and the BBC jointly commissioned the British Market Research Bureau (BMRB) to compile an official chart. The Record Retailer chart is now considered by the Official Charts Company, the current compilers of the UK Singles Chart, to be the canonical source for number-one singles for the earlier part of the 1960s. Charts compiled by Top Pops had fifteen number-one singles that did not reach the top spot in the Record Retailer chart; in comparison, a total of nine Top Pops number-ones did not top the rival New Musical Express chart. Seven Top Pops number ones did not top either of the other publications' charts. Edwin Hawkins Singers' "Oh Happy Day", Robin Gibb's "Saved by the Bell", Bee Gees' "Don't Forget to Remember", and The Tremeloes' "(Call Me) Number One" all peaked at number two in both charts, Herman's Hermits' "My Sentimental Friend" and Don Fardon's "Indian Reservation" placed with one number two and one number three in each chart, and Stevie Wonder's "My Cherie Amour" reached fourth and third spot in the two charts. Australian entertainer Rolf Harris (pictured in 2010) spent six weeks at number one in Top Pops with the song "Two Little Boys", the longest run atop the chart. 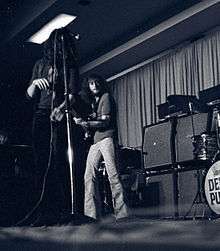 Hard rock band Deep Purple reached number one on the Top Pops chart with "Black Night", but have never achieved an officially-recognised UK number one hit. 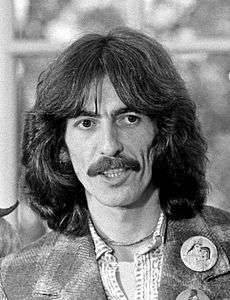 George Harrison was at number one with "My Sweet Lord" when the chart ceased publication in 1971.
considered official by the Official Charts Company. 1 2 3 4 The names, singles, week-ending dates and duration at number one are from Top Pops (later Music Now). ↑ The chart was published fortnightly at this time, so "Young Girl", which topped two fortnightly charts, spent four weeks at number one. 1 2 3 Smith, Alan. "Every No.1 in the 1960s is listed from all the nine different magazine charts!". davemcaleer.com. Archived from the original on 10 May 2011. Retrieved 4 November 2010. 1 2 Smith, Alan. "50s & 60s UK Charts – The Truth!". davemcaleer.com. Retrieved 4 November 2010. ↑ Leigh, Spencer (20 February 1998). "Music: Charting the number ones that somehow got away". The Independent. Retrieved 5 August 2010. 1 2 "Key Dates in the History of the Official UK Charts". Official Charts Company. Archived from the original on 10 January 2008. Retrieved 16 May 2010. ↑ Rees, Lazell & Osborne 1995, pp. 195–232. ↑ Rees, Lazell & Osborne 1995, pp. 208, 210–211, 213, 215, 228. ↑ "Artist Chart History: Robin Gibb". Official Charts Company. Retrieved 9 October 2010. ↑ "Artist Chart History: Edwin Hawkins Singers featuring Dorothy Combs Morrison". Official Charts Company. Retrieved 9 October 2010. ↑ "Artist Chart History: Bee Gees". Official Charts Company. Retrieved 9 October 2010. ↑ "Artist Chart History: Tremeloes". Official Charts Company. Retrieved 9 October 2010. ↑ "Artist Chart History: Herman's Hermits". Official Charts Company. Retrieved 9 October 2010. ↑ "Artist Chart History: Don Fardon". Official Charts Company. Retrieved 9 October 2010. ↑ "Artist Chart History: Stevie Wonder". Official Charts Company. Retrieved 9 October 2010. ↑ "All the Number One Singles: 1968". Official Charts Company. Retrieved 28 July 2012. ↑ "All the Number One Singles: 1969". Official Charts Company. Retrieved 13 June 2010. ↑ "All the Number One Singles: 1970". Official Charts Company. Retrieved 13 June 2010. ↑ "All the Number One Singles: 1971". Official Charts Company. Retrieved 13 June 2010.